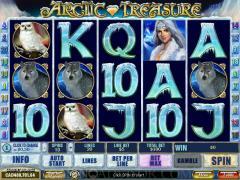 Arctic Treasure is an icy new game from Playtech that features 20 pay-lines on 5 Reels. 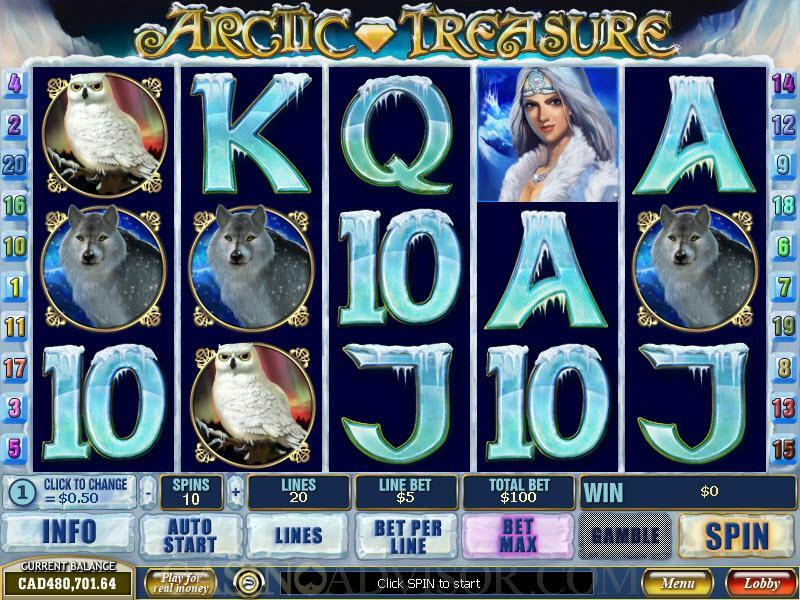 This game, as its name suggests has a very Arctic theme to it, and playing this could guarantee that you win a great treasure. The game is suitable for low rollers because the coin denomination ranges from a very low $0.01. Even the upper limit of the coin value is only $5, making it affordable for most people. Players are allowed to bet any amount, but the minimum must be $0.01. Unlike most new Cryptologic games, Playtech’s new games are only available for play in one speed. If players wish to take a rest from game play, they can choose to activate the auto-play feature which will allow the computer to continue playing the game when the number of spins and the coin denomination is fixed. Since the game has a very Arctic theme to it, its symbols also represent this. The regular symbols range from the Kayak to the polar bear, wolf, owl and card faces that range from 10 to Ace. These symbols are the ones that appear regularly on the screen, and invariably there is a payout associated with them when there are three or more regular symbols on any one enabled pay-line. 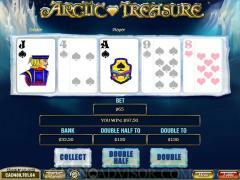 In the game of Arctic Treasure, the player is only allowed to wager a single coin per pay-line. In this way, whenever an additional coin is added to a spin, it enables one more pay-line. Each player can bet a maximum of 20 coins in a spin, and with the coin denominations as low as $0.01, the maximum bet on the lowest coin size is a mere $0.20. 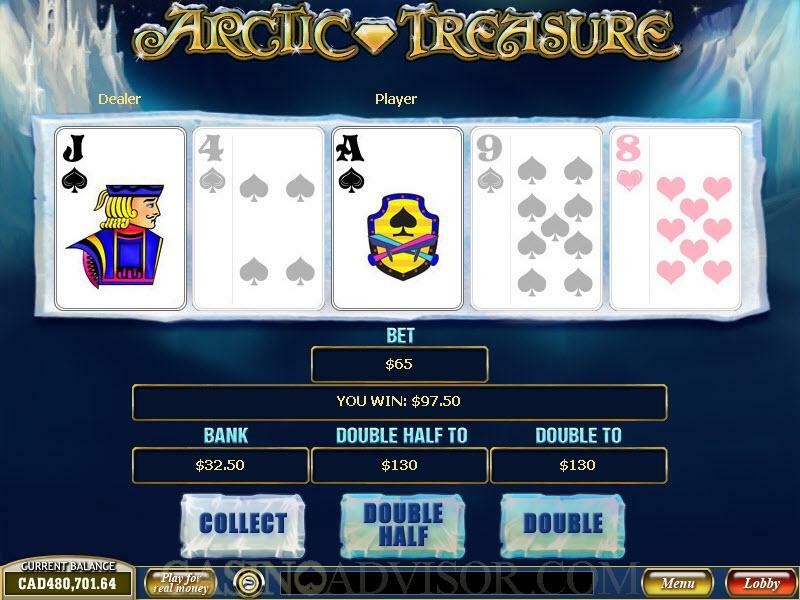 The maximum possible wager in this game is $100, and so mid-range players will also relish playing Arctic Treasures. The wild symbol in this game is the Arctic Princess symbol. This symbol can appear on any reel, and will substitute for all other symbols to complete a winning combination. The one symbol that the wild symbol cannot substitute is the scatter symbol. When there are five wild symbols in a single activated payline, the player will win the jackpot of 10,000 coins. The scatter symbol in Arctic Treasure is an Eskimo who is canoeing past an iceberg. This symbols can appear anywhere in a spin. When there are two or more scatter symbols, it completes the scatter winning combination. This combination rewards the player with up to 100x the initial line bet. When there are three or more scatter symbols, then the player wins 10 free spins. Any winning combinations formed during a free spin have its payout automatically tripled. This game also has a bonus magic pink crystal symbol. These symbols can only feature on reels 1 and 5. When there are two of these symbols in a spin, the player will get to play the bonus round which is inside an ice palace. In the bonus round, the player picks from a set of crystals from which he/she has a chance to win up to 150x the total bet. Interested in reading more detailed information about Arctic Treasure? If so Click Here for more details.